And I thought you could only enjoy elephants when traveling to Thailand. Wrong! 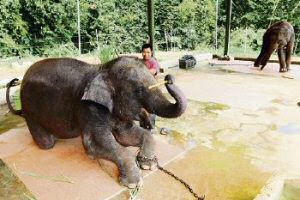 Malaysia has its own Sungai Ketiar Elephant Sanctuary open for visitors, far away on one side Lake Kenyir. Its easy to reach when you take the road that connects Lake Kenyir to the lovely Malaysian Cameron highlands. The Sungai Ketiar elephant sanctuary is near to Mount Kachang in the little village of Sungai Ketiar. One one end it's lovely to be able to see elephants in Malaysia. However, the word sanctuary reminds us that we are destroying the elephants habitat. A country like Malaysia with so much tropical rainforest and a thriving tourist industry is missing the opportunity to introduce eco-tourism for all its rainforest, nature reserves and diving and snorkeling coral reefs. However at the rate Malaysia is destroying rain forest to replace with palm oil and destroying the old colonial and Chinese houses with ugly concrete buildings, you start wondering why anyone will to travel to Malaysia in the not so near future.